When your PC begins to protest at the number of plug-ins, soft synths and soft-sampler notes you're attempting to run on it, there are various ways to proceed. Last month I discussed various upgrades that would make a single PC more powerful, but it's sometimes easier to spread the processing load between several computers, so this month I'm going to concentrate on networking. This may also be a cheaper option than upgrading, if you've already got a spare PC that can be pressed into service. After all, many of us have amassed several computers over the years. Traditionally, home networks have been employed to let multiple family users share the same printer or Internet connection, access shared files, stream media content around the house or play multi-user games. However, the musician can also benefit from their distributed processing capability, as well as being able to back up audio projects to another computer for greater safety, and to share other devices, such as DVD burners, external hard drives and so on. Even if you've already got a very powerful PC, setting up a network will create a resource that can expand with your requirements: if you need to run more tracks and notes in your scores, add another PC. And if you have a laptop for live work, but a more powerful desktop PC in the studio, networking them will let you combine their processing power during the mixdown phase when you generally need to run more plug-ins. If, like many musicians, you're worried about having your music PC connected to the Internet, a network can also provide a little more security. One computer can be net-enabled and stuffed to the gills with firewall, anti-virus and anti-spyware utilities, so that you can deal with emails, visit the SOS forums and download application updates. Any other computers on the network need only be active when you're actually making music or want to transfer music updates across via the network. For even more security, you could use interchangeable hard-drive caddies on the music PC, so that the one containing your Windows music partition is never plugged in while the Internet machine is on-line and exposed to virus attacks. Yet another advantage of a network is that you can make it cross-platform, so that, for instance, Mac users could add PC-only software to their sonic arsenal by having a PC on their network. The advantages of networking are clear — but how do you actually send music signals from one PC to another? The simplest way to musically join two or more computers is via a MIDI cable. By connecting the MIDI interface outputs from the master PC running a MIDI + Audio sequencer to a MIDI interface input on the slave machines, you create a MIDI network and you are effectively turning the additional machines into stand-alone hardware synths. If you already have MIDI and audio interfaces on each machine there may also be no extra hardware to buy or set up (but see 'Audio Routing & Mixing' box for alternative approaches). If you only want to run a few soft synths on your additional PCs, you may not need a host application for them, either. For example, most products from Native Instruments are supplied in stand-alone versions as well as in plug-in form, as is the AAS range (Lounge Lizard, String Studio and Tassman), along with many other manufacturers' ranges, while 'software studios' such as Arturia's Storm, Cakewalk's Project 5 and Propellerhead's Reason all run as stand-alone applications. There are, however, some situations in which running a sequencer on each machine and synchronising them via MIDI (running one as the Master and the others as Slaves) provides advantages. A MIDI connection would, for instance, allow you to link different sequencer programs together, either all running on PCs or on a mixture of Macs and PCs. However, even if you do need a sequencer for your additional computers, it needn't necessarily be an expensive flagship version. 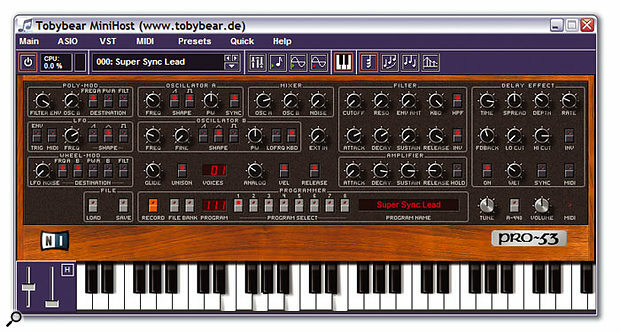 Not only are there plenty of entry-level versions that could be perfectly adequate (see PC Musician April 2005 for more details), but since the 'remote sequencers' only need to be able to host plug-ins and soft synths, and require no recording or editing functions, a much simpler host utility could be pressed into service. There are now plenty to choose from. As they all differ slightly in their facilities but are all comparatively small applications, your best bet is to download a few demo versions to see which one suits you best. One of the simplest host applications: Xlutop's Chainer. One of the simplest is Xlutop's Chainer (www.xlutop.com), which allows you to stream up to 10 chains of VST instruments and plug-ins. The demo version is a tiny 245K download and the full version costs just $60. Dsound's RT Player Pro (www.dsound1.com) supports up to 24 VST plug-ins and Instruments and multiple MIDI inputs, and it includes 13 effects, for around 150 Euros, but doesn't have a demo version (although M Audio interface owners can download the simpler OEM RT Player Express version for free. 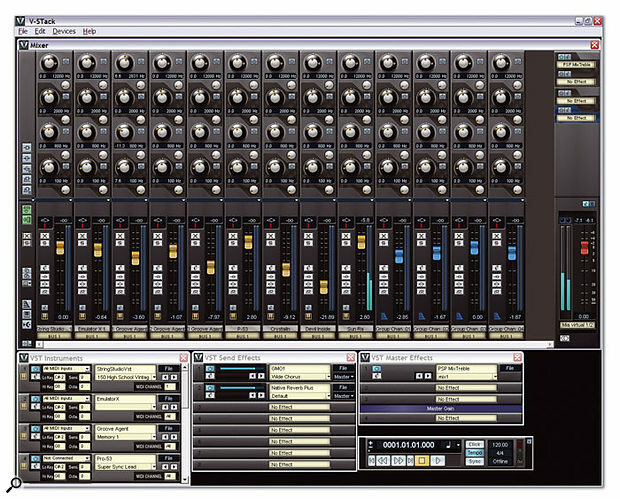 Spin Audio's Virtual Mixing Console (www.spinaudio.com) is another host with rather more advanced effects included, allowing up to 16 VSTis to be treated with the integral four-band parametric EQs in each of its mixer channels, as well as with other VST effects. A 4.5MB demo is available and the full version costs just $59. Brainspawn's Forte (www.brainspawn.com) costs £75, supports up to 32 VST Instruments and associated effect plug-ins, and was discussed in detail by Marillion's Mark Kelly in our May 2005 SOS Live supplement. While it's optimised for stage use, it's ideal as a low-latency host driven from a separate PC, and the demo is only 3.3MB in size. Brainspawn's Forte is ideal as a low-latency host driven from a separate PC. Steinberg's V-Stack (www.steinberg.de) is only available as a 10.4MB download direct from the Steinberg web site but is discussed in more detail later on, since it also offers internal synchronisation with other Steinberg applications. Finally, there are also a few free host applications out there if you look hard enough, such as the 84K Simple Virtual Host from FXpansion (www.fxpansion.com/skunk/svh14.zip), and (possibly the most popular of all) the donationware Minihost from Toby Bear Productions (www.tobybear.de/p_minihost.html). 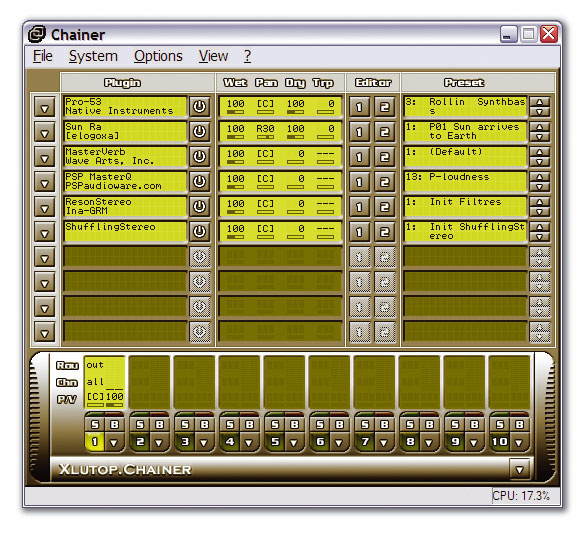 To run plug-ins and soft synths on remote PCs, you may only need a comparatively simple host application, such as Xlutop's Chainer, Brainspawn's Forte or Toby Bear's Mini Host, shown here. Although some SOS readers might already be able to wire up a network in their sleep, having had vast experience of them in office life, others find the whole process totally baffling and full of arcane terminology. Here are some definitions that explain the basics. Ethernet: The most widely installed Local Area Network technology, with a transmission rate of 10Mbps (Megabits per second). The newer Fast Ethernet standard increases this rate to 100 Megabits per second, and if the LAN port on your computer is specified as 10/100 Ethernet, it supports both of these standards. Finally, as its name implies, Gigabit Ethernet runs at 1000Mbps. It's the most desirable of the three if you're going to attempt to send audio signals across your network. Intranet: A private network of various computers within an organisation such as a company or educational establishment, which looks to its users like a private version of the Internet. IP (Internet Protocol) Address: A string of four numbers, separated by dots, that uniquely identifies each machine on a network. For instance, to link two computers on a home network you might give them the addresses 192.168.0.200 and 192.168.0.201. LAN (Local Area Network): This is the most popular configuration, used by offices and in homes to interconnect lots of computers that are all situated in the same physical area, so that they can operate independently while communicating with each other. mLAN (music Local Area Network): A Firewire-based proprietary protocol developed by Yamaha for high-speed transmission and control of audio and MIDI ports over a network. NIC (Network Interface Card): The majority of PC motherboards are now equipped with built-in LAN network ports and associated RJ-45 connectors, but if yours is not you can buy an NIC very cheaply, in either PCMCIA format for a laptop or PCI for a desktop machine. Peer To Peer: Also known as ad hoc or point-to-point mode, this is the most common example of two PCs connected together without requiring any other equipment, often simply to share files or a printer. WAN (Wide Area Network): Generally a bunch of computers or LANs, but in different locations, connected via a phone line or satellite link. Once again, each machine operates independently while communicating with the others. Wi-fi: Also known as 802.11 networking and wireless networking, this is a very convenient way to install a network, since the various computers can be in different parts of your home or studio and don't need cables running between them. For musicians, it has the added advantage that you can place noisy backup machines in the garage or loft. The IEEE (Institute of Electrical and Electronic Engineers) created three standards for wireless networking. The first, 802.11b, is the slowest and cheapest, transmits at 2.4GHz, has a bandwidth of 11 Megabits per second, and is part of Intel's Centrino specification; 802.11a operates at 5GHz and can handle up to 54 Megabits per second; and 802.11g offers the same maximum bandwidth but operates at 2.4GHz, to bring the price down. None of these technologies seems to generate any audio interference problems in a studio environment, although 802.11a is less prone to interference from wireless phones, microwave ovens and other communications devices. However, if you have the choice, wired networks nearly always offer much faster performance. If your PCs already have some type of network port, you may not even need to have a hardware MIDI interface on each one to run synchronised music applications. 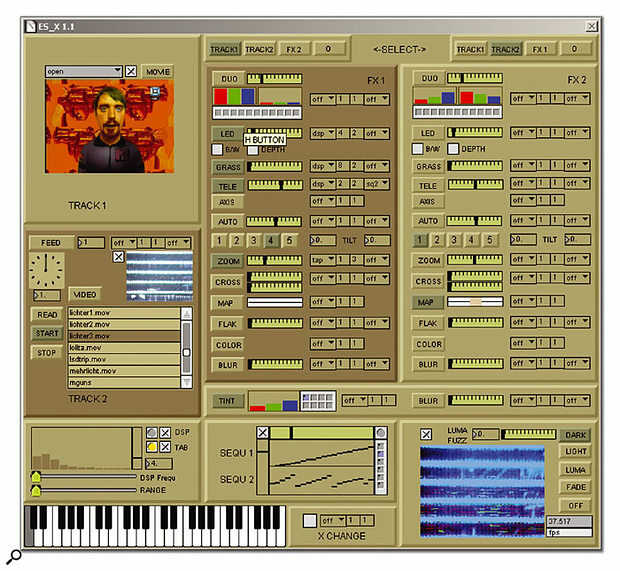 MIDIoverLAN (www.musiclab.com) was designed as a simple, robust utility to connect MIDI applications spread amongst severally locally networked computers. However, it also allows you to interconnect several MIDI applications on the same computer, so that you can port MIDI data from one to the other at will. With a Local Area Network connecting your computers, the MIDIoverLAN utility provides a simple and rugged way to send MIDI signals between them, without needing hardware MIDI interfaces. In 2004, a major update turned this utility into the rather more ambitious MIDI over LAN CP (Cross Platform), enabling you to create a MIDI network containing both Mac and PC machines. MIDI timing accuracy is also claimed to be even better than in previous versions. It requires Windows 2000 SP4 or XP SP1 and later, or Mac OSX 10.2.4 or later. 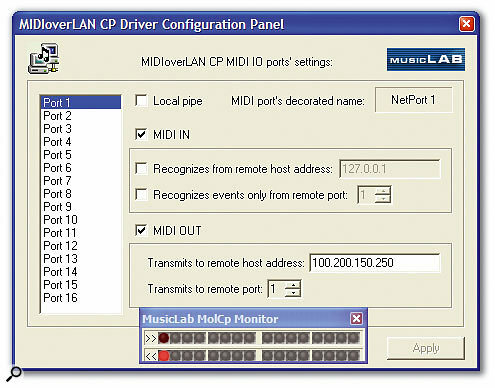 Now at version 2.2, MIDI over LAN CP is available in a Standard edition that supports up to 16 'Netport' MIDI devices (each device acts like a standard MIDI port that provides up to 16 simultaneous channels, so the maximum total number of MIDI channels is 256), while the Platinum version supports up to 64 ports, for up to 1024 MIDI channels. Each MIDI over LAN CP device also has multi-client driver support for up to four clients, making it easier (for instance) to run a sequencer output and synth editor simultaneously to the same destination synth. Prices start at $129 (about £70) for the most typical two-computer setup ($169 for the Platinum version), and jump to $199 ($269) for a bundle for four computers and $299 ($369) for eight. A 1.4MB demo version that runs for 14 days is also available to download. I had no problems installing and getting the Standard version running. So that it can be configured to suit your setup, the MIDI In and Out can be enabled independently for each of the available ports (labelled Netport1 to Netport16) and the MIDI In can be configured to receive data from any host PC, or only from a specific IP Address (see 'Technical Terminology' box). The MIDI Outs must always be set to point to the recipient PC's IP Address. There's a handy MIDI monitor that displays MIDIoverLAN activity, and overall I found that this utility worked faultlessly on my PCs. OSC (Open Sound Control) is rather different from most of the other networking options discussed here, because support for it needs to be implemented in the application itself. It's defined as an 'open, network-independent protocol developed for communication among computers, sound synthesisers and other multimedia devices', and lets you send MIDI data between multiple computers over any Local Area Network (LAN) or the Internet. Various scenarios are suggested as possibilities, including Internet-based collaborations between musicians, co-ordinated synthesis between two or more computers to increase processing power, and sound installations with dozens of computers in a single room. Some PC music applications that support OSC include Plogue's Bidule modular environment (www.plogue.com), and Cycling 74's Max/MSP real-time audio development environment (www.cycling74.com). Anyone interested in Jazz Mutant's amazing Lemur controller (www.jazzmutant.com) will also discover that it communicates using a LAN interface and the OSC protocol. However, possibly OSC's biggest commercial supporter is Native Instruments, whose Intakt, Reaktor and Traktor synths have all got OSC extensions. Support for OSC has been extended in the just-released Reaktor 5, which has a dedicated OSC Settings window where you activate it, set up synchronisation and scan for and display other OSC members to whom a connection has been established. NI consider OSC to be a sadly overlooked technology that's far more powerful than MIDI, and other enthusiastic users also point to improvements over the MIDI spec, such as its much greater 32-bit resolution for altering parameters such as filter frequency in real time, and the fact that no extra interface is required. If you want to find out more, Open Sound Control's home page is at www.cnmat.berkeley.edu/ OpenSoundControl. If your MIDI + Audio sequencer is Steinberg's Cubase SX/SL, Cubase VST 5.2 or Nuendo, you already have the proprietary VST System Link networking functions built in. To use them, you need an audio interface on each computer, running ASIO drivers, and with an ADAT, AES/EBU, S/PDIF or TDIF digital audio connection. The networking signal is then sent between the machines using one bit of the existing digital audio signal. It makes no audible difference to audio quality. 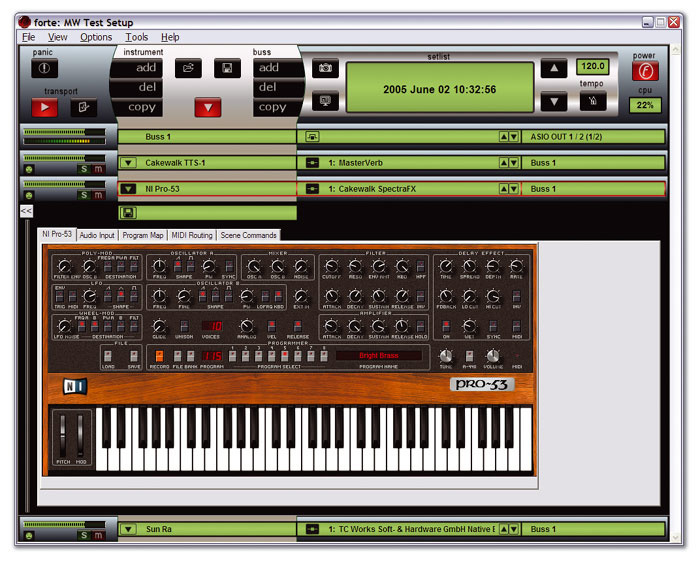 Steinberg's V-Stack is another simple host application, with the advantage that it can be linked to Cubase or Nuendo running on another computer, via a simple digital audio cable, for sample-accurate synchronisation. If you've already got one of these applications installed on all the computers in your proposed network there's nothing else to buy. However, If not, Steinberg's V-Stack is a cheap way to expand your VST System Link studio. It's a simple host application that lets you run up to 16 VST Instruments with up to five VST or DX insert effects and eight send effects per channel, as well as providing four-band EQ and up to four subgroups in its integral mixer. It can also be used as a simple stand-alone host to run VST Instruments in a live setup, and provides layering, transpose and split functions. Version 1.2 runs on both Mac and PC and you can buy and download it directly from the Steinberg web site for just 50 Euros. V-Stack certainly provides a familiar interface and I had no problems using it as a stand-alone host. With System Link, since the digital audio cables already carry a clock signal there's no need for separate sync, and linked machines should stay locked together with sample accuracy. One device should run from its internal clock and therefore be the Master, providing the clock signal for all the others that are set to external clock as Slaves. The only exception is when you're using a dedicated word-clock generator or digital mixing desk, in which case all the audio interfaces should be set to Slave mode. Those with multiple copies of Cubase and/or Nuendo and V-Stack should find System Link an elegant solution, but unfortunately success is not 100 percent guaranteed. Steinberg have found that the drivers of some makes and models of audio interface simply don't comply sufficiently well with the ASIO 2.0 protocol for them to work reliably with System Link, so a few may suffer from clicks, pops and crackling. I personally experienced some lockup problems when attempting to link multiple PCs. It's worth reading the VST System Link Troubleshooting section of Steinberg's Knowledgebase for fault-finding tips. In essence, there are two approaches to creating a network, depending on how many computers you want to link together. The simplest setup is for two machines, each with RJ45 LAN ports, since they can be directly linked via a CAT 5 crossover cable that costs about £5. 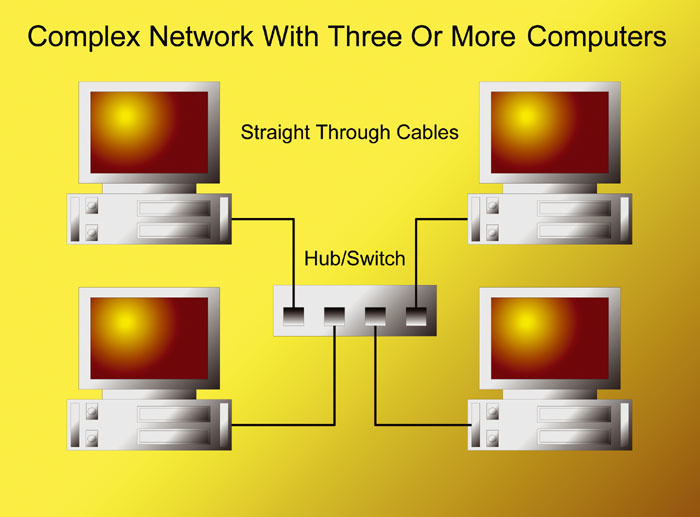 If you want more machines in your network, you will instead need a stand-alone hardware hub or switch and CAT 5 'straight through' cables connecting each of your computers to it. A hub is generally cheaper and easier to set up than a switch, but since it sends the data received at one of its ports to all the others, your network may become bogged down when lots of data is flying around. Switches are generally preferred on networks containing four or more computers, or when you intend to transfer lots of data, because they only send incoming data to its intended destination, resulting in less network congestion. Another approach if you have two PCs with Firewire ports is to use these for the network connection, with a standard Firewire cable between the two. If, on the other hand, the PCs on your proposed network have wireless (Wi-fi) network support, you don't need any cables at all, although the much lower bandwidth won't be very suitable for transferring real-time audio streams. People's experiences of setting up a network vary enormously, from those who plug in the appropriate cable to each computer and find everything works immediately without any further setup, to those who spend days trying to get things working properly, often due to some obscure hardware parameter setting. Fortunately, Windows XP is generally regarded as the easiest Microsoft operating system to date on which to set up a network, and there are copious details on creating a home or small office network in the integral Help and Support Center, and a Network Setup Wizard that you can run by double-clicking on its icon in Control Panel (you'll need to do this on each PC destined to be connected to the network). If you still run into problems, you'll also find plenty of step-by-step guides on the Internet. For a beginner's guide try 'How Home Networking Works' on the How Stuff Works web site. Those of a more technical bent may prefer Tweak Town's Windows XP Home Networking Guide (click on the 'Guides' link from the www.tweaktown.com home page). By the way, if you can't get your new network to work at all and have followed the advice of some of the web sites that suggest 'unwanted' Windows services, you may have disabled some that you now need. One of the best places to find out which services are required and which are not is the Elder Geek's Service Guide at www.theeldergeek.com/services_guide.htm. System Link will obviously appeal to anyone who already uses Steinberg software and who has an S/PDIF-equipped interface in each computer. However, FX Teleport (www.fx-max.com) is another very clever network-based utility that takes a rather different approach: it appears to the audio application running on your main PC as an extra set of plug-ins and soft synths that are, in fact, being run on remote PCs via a 100Mbps or Gigabit TCP/IP LAN connection. As with MIDI over LAN, this means that you don't need MIDI interfaces on each computer, but even better for those on a budget is the fact that you don't need to run a host application on the remote PCs either. The installed VST-format plug-ins and instruments on the remote PCs simply appear to your VST-compatible host application (Cubase, Nuendo, Sonar and so on) on the main PC as 'LAN' versions. Best of all, since the remote VST plug-ins rely on audio send/return streaming via the LAN connection, and the remote VST instruments return their audio outputs via the the same means, you don't even need an audio interface on the slave computers. A single 'FXTeleportSetup.exe' file is supplied that you run on each PC in your network. During this process, you need to designate the machine running your DAW host/sequencer as the Master (Host) computer, and each of the others that will run extra plug-ins as Slave (Server). Then you start the FX Teleport Server utilities on each Slave PC and run the Install Effects utility on the Host computer. The latter will scan the VST plug-in folders on the various slave PCs to find what 'remote' plug-ins and instruments have been installed there and add these as options inside the VST plug-in folder of your Host PC with '(LAN)' appended to their names. When you first launch one of these new options, a window pops up to inform you that 'Network Latency detection is in progress'. FX Teleport is calculating the extra delays involved in sending/receiving the audio signal via the network, so that it can compensate for them automatically, just like a DSP effects card such as TC's Powercore or Universal Audio's UAD1. On my PC this latency was 512 samples (11.6ms at 44.1kHz). There's little to see on the host PC once FX Teleport has been installed, other than a new FX Teleport folder in your plug-in and Instrument lists, containing the (LAN) versions of everything installed in the remote PC VST plug-ins folder, and these small information windows displaying connection and preset details. Detailed editing is performed on the remote PC. You can choose presets from either Slave or Host PCs, but more in-depth parameter editing is done on the Slave's screen. However, the tweaks you make there are remembered at the Host end and saved with your song, so that the next time you open it the relevant LAN plug-ins are reloaded on the Slave machines, with their settings intact. Any automation data relating to the FX Teleport devices also remains on your main PC, to be saved with your song. This is far easier to manage than having to save another set of data for each song on each Slave PC, to remember the plug-ins, instruments and settings associated with it. The only disadvantage I can think of is that DirectX plug-ins aren't supported. Overall, FX Teleport (see screen above) provides such an elegant approach to distributed processing that I'm not surprised so many musicians are already using it, especially as its most popular '1 host + 1 server' configuration costs just $99, and the 'per server' price drops for more complex setups. 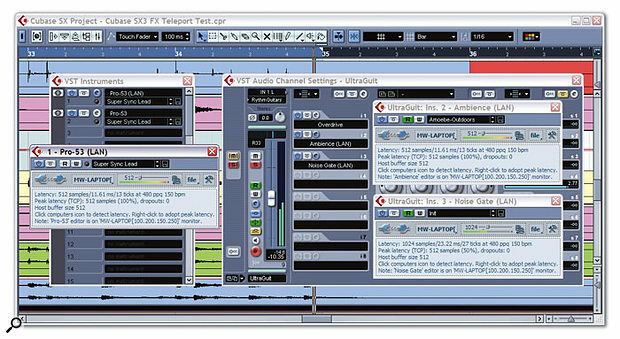 FX-MAX also have Giga Teleport in their range, which performs similar magic for remote PCs running Tascam's Gigastudio. It fools Gigastudio into thinking that it's running with an audio interface with GSIF format, but in fact sends the audio data over a 100Mbps or Gigabit network connection, like FX Teleport. Offering up to 32 audio outputs at sample rates of up to 192kHz, and as many as 128 MIDI channels when used with Gigastudio 3, it runs on Windows 2000 or XP and can be used on multiple PCs to achieve higher Gigastudio polyphony (subject to network performance). Of course, given the much greater bandwidth requirements of audio over MIDI data, FX and Giga Teleport will both benefit from a fast Gigabit network. However, even with the 100Mpbs network I was running I experienced very few FX Teleport problems. I chose to mostly run a few demanding reverb plug-ins and soft synths on the remote PC, rather than lots of less demanding plug-ins, so that only a few simultaneous audio streams were active. While researching this feature, I talked to some very different musicians who have used various types of networks with music applications. Samplecraze (www.samplecraze.com) is owned and run by Eddie Bazil (AKA Zukan in the SOS Forum), a sound designer, sample developer, programmer and musician who has a network of three computers — two PCs and a Mac. "One PC is dedicated to the Internet and nothing else, and the other two are for audio only, for working on different platforms. The network enables all three to share files and for their ultimate upload to the net. By working remotely, I minimise the virus threats considerably. 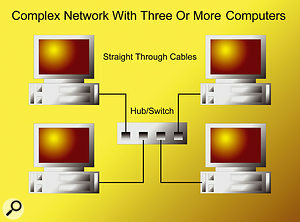 The computers are networked to each other using a network switch as opposed to a standard hub. This way, all three can act as both slaves and masters and can be routed to each other in any combination". Visual artist John Dekron and multimedia artist Markus Schneider are already pushing the boundaries with OSC-networked computers in a live performance environment. This is a screenshot captured from their specially developed ES-X live performance software, which mixes and treats live satellite TV images while Reaktor 5 modifies the incoming audio, with overall control via Jazz Mutant's Lemur controller. Among their many and varied multimedia activities, visual artist John Dekron and multimedia artist Markus Schneider (forming RISC, together with Christian Riekoff) are currently involved in setting up an audio-visual live performance environment, with NI's Reaktor generating live audio, synchronised using Open Sound Control (see earlier box) to Cycling 74's Max/MSP graphical environment, which is in turn running ES-X, a video live-performance program developed by John Dekron and Michael Brux using Cycling 74's range of Jitter graphic objects for the Max environment. Overall control of both audio and visual elements will be using the new Lemur controller by Jazz Mutant. Markus told me that "OSC is pretty new in our work setup and right now we're not sure how far we will go with it — it partly depends on the future developments within the protocol and companies supporting it. For a project on June 11 we are going to integrate the Lemur. We will mix satellite TV images live on stage in the Maria Club (www.clubmaria.de) here in Berlin. The TV images will be treated by ES-X and the TV audio will run through Reaktor. We will control image and sound simultaneously using the Lemur." If you'd like to find out more, visit www.risclab.org or www.thisserver.de/john_dekron.php. You don't have to restrict yourself to physically connecting multiple computers in the same room to network with other musicians: there are also various ways to collaborate via an Internet or similar connection using a WAN (Wide Area Network). One of the simplest is Microsoft's Remote Desktop, which you can use with Windows NT Server 4, 2000 Server, Server 2003 or XP Professional. Using this, you can access a Windows-based PC and work with its applications and files from another computer (even from a Mac if using the Remote Desktop Client for Mac OS X version 10.2.8 or later). Alternative remote control software includes VNC (Virtual Network Computing), a free download from www.realvnc.com. Like Remote Desktop, it allows you to view and interact with a remote server computer using a simple 'viewer' program running on another computer anywhere on the Internet. However, if you want to be able to send your MIDI and audio tracks in both directions in a fairly transparent way, you'll need something a little more sophisticated. In 1998, Rocket Network Inc created a way for musicians to share their files, which was taken up by Steinberg at the beginning of 1999. A new 'Rocket' button appeared in Cubase VST that let users post tracks to the Rocket Network Central Server so that they could be shared, within minutes, with other musicians collaborating on that project. Logic Audio and Pro Tools users later got in on the act as well, and the files could be sent in any format, including WAV, MP3 and MIDI. Rocket Network's Central Server held the most up-to-date arrangement of each project, which was downloaded to each musician as they entered a 'session'. At the time it was hailed as revolutionary, but before broadband was widely available it could be very slow to update (sometimes several minutes elapsed before new sessions were received), so real-time collaboration between musicians wasn't possible. The Cubase and Logic versions wouldn't talk to each other either. Nevertheless, the Rocket Network was used in some high-powered projects, such as the 2001 soundtrack for the film Bridget Jones' Diary. Avid/Digidesign acquired the assets of Rocket Network Inc in 2003 and subsequently released Digidelivery — a fast, reliable, and secure way to send any kind of digital file via the Internet that has been adopted by many professional music developers around the world. It's particularly useful to Pro Tools users, since they can drag and drop their sessions onto the Digidelivery interface to package and deliver all related files. Fast-forward to 2005 and Pro Tools owners can now interact in real time with other Pro Tools users, using the clever technology of the Source-Connect Pro Tools plug-in (www.source-elements.com). Broadcast-quality audio is transmitted between remote locations via broadband Internet connections, so you can collaborate with other musicians around the world. However, only Pro Tools users can benefit from this product, and at $1495 not everyone will be able to afford it. One of the reasons why I was particularly impressed with FX Teleport is that it enables you to view and edit your entire mix on one computer, even when some of it is actually running on other machines. With all the other 'solutions' mentioned in this article you still have to decide how to combine the multiple audio contributions into the final mix, even once you've got your PCs successfully networked together. There seem to be almost as many alternatives as there are musicians running such systems, so here are a few options to consider. One of the simplest approaches for anyone who's already using an analogue mixer is to patch all the audio 'PC synth' outputs into it, adding analogue EQ and effects to taste, and recording the overall mix, along with the contribution of any hardware MIDI synths, via the analogue inputs of the audio interface on your master PC. The preferred approach for many musicians is to use spare soundcard inputs on the host machine to directly patch in the remote audio contributions. This means you don't need an external mixer, and with sufficient audio interface I/O you can stream all your remote soft synths to separate tracks on your host sequencer and treat them there individually with host plug-in effects. Even better, those with ADAT I/O can stream their audio digitally for a cleaner signal. It's certainly a more elegant solution if you can set all your channel levels, pans, automation and so on, plus plug-in treatments for both local and remote soft synths, so that they can be saved in one host project or song file, rather than as several files across multiple computers. 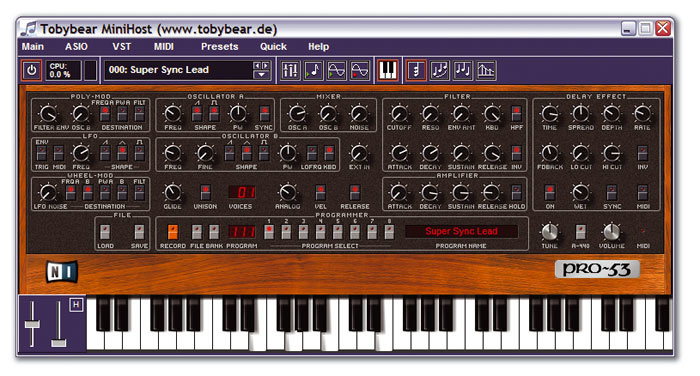 Nevertheless, some musicians prefer to run both soft synths and associated plug-in effects on the remote computers, keeping these settings together, as you do with the presets of most hardware MIDI synths, and then do the mix and automate settings on the master PC. It's up to you. For the rest of us, Digital Musician Net (www.digitalmusician.net) might be exactly what the doctor ordered. Again, it uses a proprietary plug-in that needs to be run on each computer, but this time the format is the rather more universal VST 2.0. 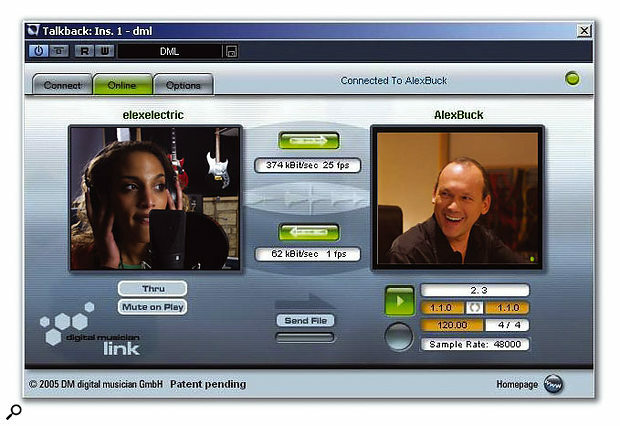 Audio or MIDI collaborations are not only in real time, via a broadband Internet link, but both parties can also see each other and discuss the performance (just as you can in the studio through the control-room window) via twin video-conferencing windows in the plug-in that run at up to 25 frames per second. Fancy collaborating on a track with other musicians around the globe? Digital Musician Net runs as a VST 2 plug-in inside many host applications, transfers audio and MIDI data in real time, and even lets you see your collaborator via a two-way video link. Digital Musician Net already runs on both Mac and PC platforms. If used with Cubase SX 3 and Nuendo 3 it offers synchronised audio, MIDI, MTC (MIDI Time Code) and remote control, and synchronised audio on Live, Sonar, Logic 7 ( and even Logic 5.5 on the PC). MIDI, remote control and other applications may well be supported on these and other applications by the time DMN officially launches in August 2005. Bit rates of up to 256kbit MP3 can be achieved in real time and, unlike Rocket Networks, no central server is required. Audio or MIDI data is sent to and fro directly between collaborators. Time-stamping and intelligent buffering is used to compensate for latency or web congestion, and if your particular link means that you have to resort to a lower bandwidth while recording takes place, you can transfer the final take later on at CD quality, using the plug-in's built-in Send File function. Digital Musician Net is aimed squarely at musicians and other audio professionals who want to network their services around the world, and there's already been lots of interest from individual artists, producers, studios and film composers. Amazingly, Digital Musician Net 's Standard Account is completely free and entitles you to join the DMN web site community, where you can meet like-minded souls around the world, advertise your talents and arrange collaborations, the sole limitation being that the audio bandwidth is limited to 128kbps. A premium Studio Account, available from just 24 Euros a month, ups the bandwidth to 256kbps, provides email support, an extended studio home page to allow you to advertise your services around the world to other professionals, and the ability to set up sub-accounts (so that a studio can let multiple clients use their higher-bandwidth link at different times). Digital Musician Net is poised to launch in August 2005, but it was already extremely stable when I saw it demonstrated in early April at the Frankfurt Musikmesse. So, for instance, if all the computers on your network have both Fast Ethernet and Firewire 400 ports, you'll manage more plug-ins and soft synths using Firewire. As we've seen, music-making need no longer be confined to a single computer, or even a single location. Whether you need more processing power, to run several applications simultaneously, or want to collaborate with other musicians, the key may be creating a music network. However, before you make a final decision on whether or not to install networking capability on your music PC, don't assume that it will automatically provide you with better performance. While there are plenty of musicians providing glowing reports of how liberating their multi-PC setups have proven to be, I've also come across plenty of others who either never got a network to work reliably with their particular machines, who experience dropout problems during audio recording and playback after installing a network interface card, or who have never managed to completely eradicate audio clicks and pops or timing problems in a more complex setup. Fortunately, nearly all the applications and utilities discussed in this feature can be tried out using free demo versions, so you can test the water before committing yourself, and many musicians I know have tried out two or three programs before deciding on which one to go with. Once you've spread your networking wings you may never want to go back to a one-box solution!